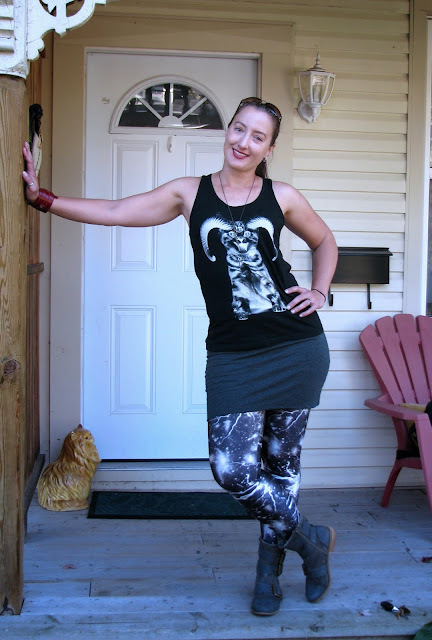 I photographed this woman a couple of years ago, wearing a pair of pants made by The Fairies Pyjamas, and was happy to see that she still had the same cool style esthetic. Jennifer Chesnut was one of the co-organizers of this year's L.O.O.K Festival (Locally Organized Organic Knowledge) at the Western Fair Farmers' Market, and she expresses her eco-friendly values in the way she shops for clothes. 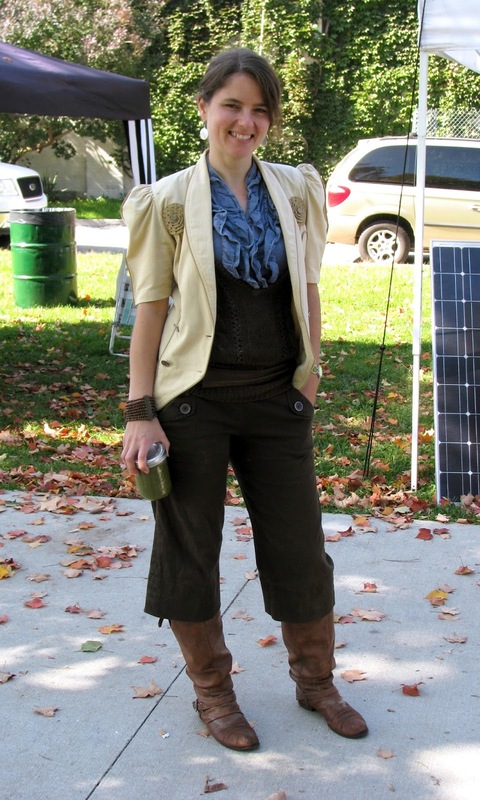 Most of her clothing comes from Goodwill Thrift Stores, and she looks at labels to see where the clothes were made. "I want to know whose hands made the garments I wear". I finally had time to take a really good look at the Stephen Watson Memorial Mural that was completed at the end of August. The mural was sponsored by ArtFusion, and pays tribute to the late artist and ocean activist, Stephen Watson. 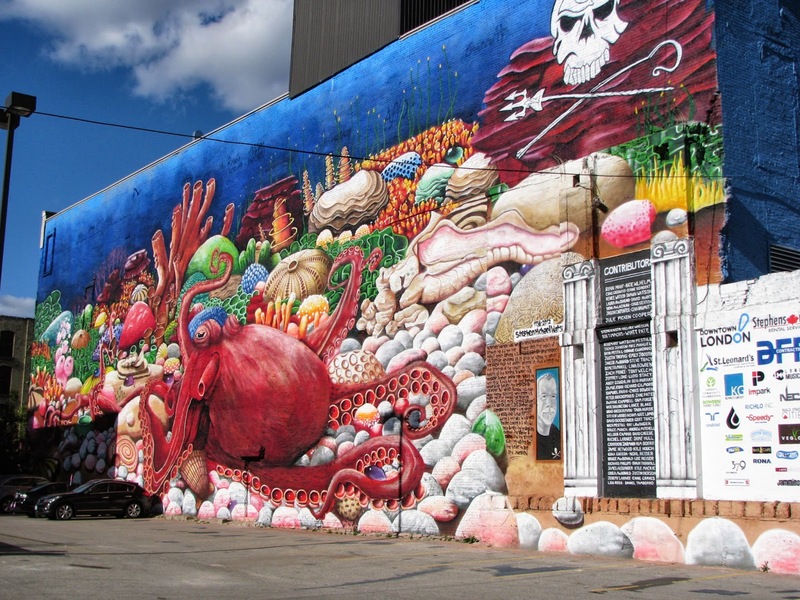 The mural, London's largest, is located on a wall off of Dundas Street, between Richmond and Clarence, and is a recreation of the last painting that Watson completed, titled "Octopus' Garden 2". The mural was completed to coincide with the one-year anniversary of the artist's death from lung cancer, and was unveiled during a three-day celebration. The mural was painted with the help of a crane, and adds some much needed colour and visual appeal to our challenged downtown core. I found this little (7" high) Geisha doll at the Good Value Department Thrift Store that is currently occupying the space on Dundas Street formerly occupied by the Metropolitan Artisans' Market. The doll was interesting enough, but it was the fact that she came with 6 different geisha wigs that won me over (and that she was very inexpensive). I've never seen a doll like her, and while there's no indication on her as to where she was made, I'm thinking that given the detail on the wigs, it had to have been Japan. 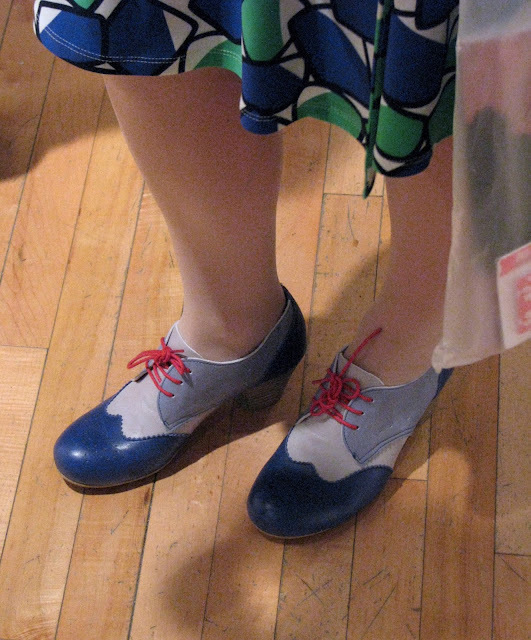 I was quite enamoured with these shoes worn by a fellow attendee at the opening of the Diana Thorneycroft show at the Michael Gibson Gallery on Friday night. At first I thought they might be Fluevogs, but they are not, and the wearer wasn't sure of the brand. I purchased this book at Phantastica yesterday and couldn't wait to start reading it. 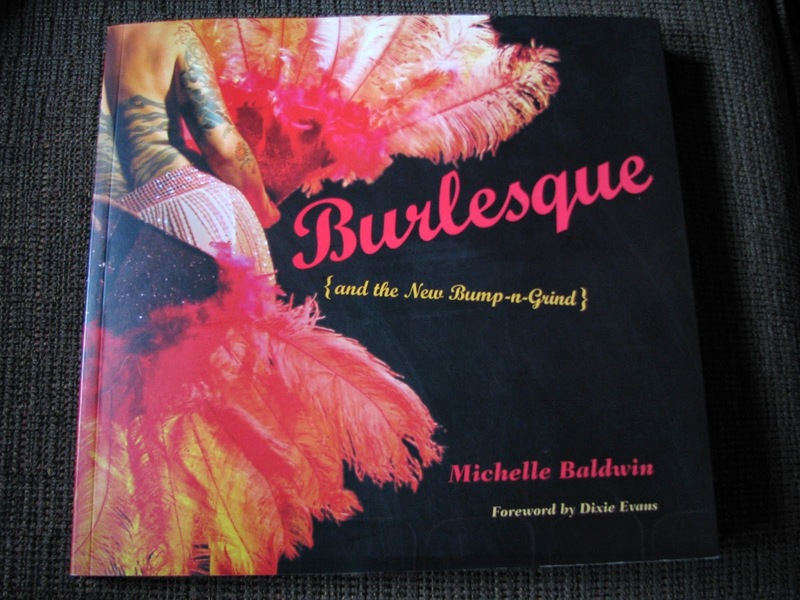 It's an entertaining combination of information on the history of Burlesque, the neo-burlesque revival of the last several years, costumes, etc. written in a conversational prose style, interspersed with black and white and colour photos of classic and current Burlesque performers. Those shoes do look like Fluevogs. What a fabulous mural - I love seeing art up on buildings. Digging that first gals outfit for sure!the mural is gorgeous and what a beautiful tribute! I have only seen 2 burlesque shows and I loved both! What sweet seduction! The mural is an amazing tribute! Your eye never fails, nor do the words used to describe what catches your attention. You have an eye for interesting patterns and shapes. I like everything in this post - the mural is amazing, I agree, street art can really inject life and passion into parts of town which need a bit of love. 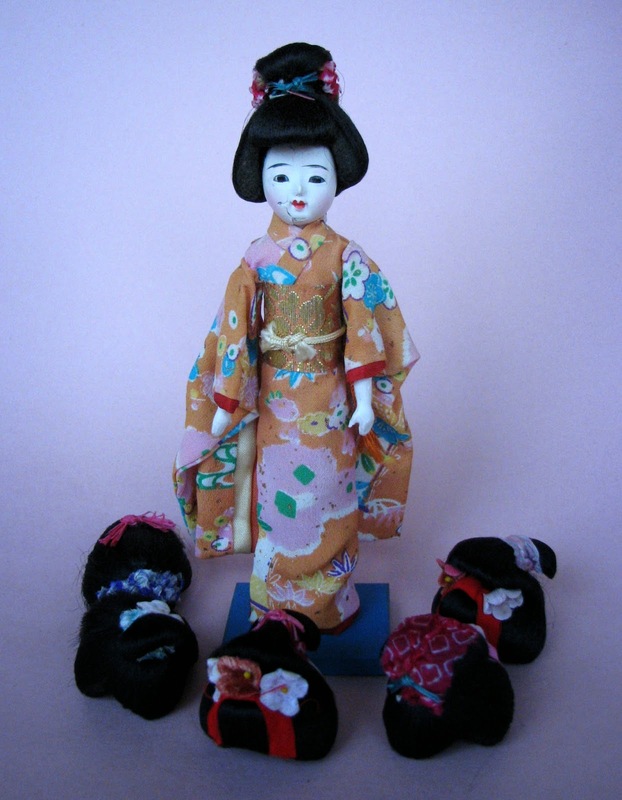 That Geisha doll is fabulous, I love all her tiny wigs! omg, a weird doll with wigs! Awesome. The mural is beautiful. The mural is amazing--the octopus looks REAL!! The doll is so cool!! That book is on my want list! The geisha doll with the wigs is the ultimate best i have seen! In fact, never seen anything like that, fun to find stuff like that! You are going soon to NY? you must so so excited! My goodness, that mural is amazing! As ever, you capture all sorts of people, clothing, sights, stuff, which make me look twice, you have such a good eye, Shelley.